I'm well aware that this question perfectly showcases my spectacular ignorance, but oh well. It's a simple enough question, so here we go. I have a 595 chip (SN74HC595) wired up to an Arduino, fed by the 5V output. After switching all the outputs on, I measured an output pin at 5.04V and 74mA. I want to use the chip's outputs to switch transistors (P2N2222A) which will have 60 mA through them (switching common cathode RGB LEDs), so I believe I need to drop it down to around .6 to 1.2V at .6mA, right (I'm not at all sure I'm reading the datasheet right)? So how exactly do I do that? It seems like I need to put a resistor in between the pin and the base, but don't I need to know the TOTAL resistance of the circuit? Or can I just calculate from the pin itself (I believe that would need 7K)? Thanks in advance for your help, and please feel free to OVER-explain if you're so inclined. 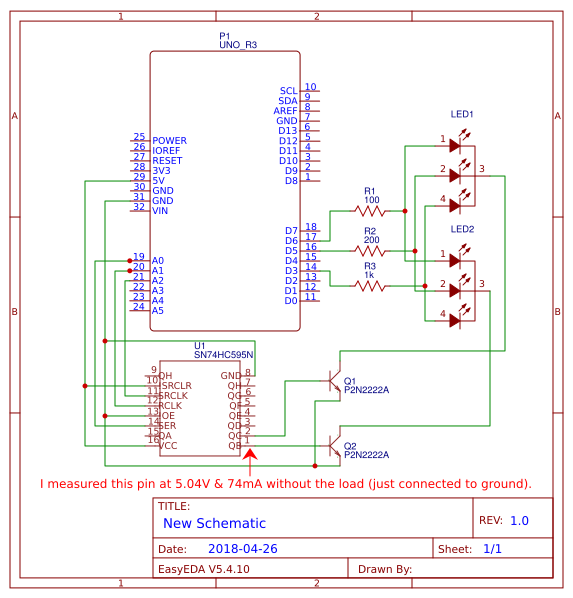 EDIT 2: Resistor values are listed wrong. R1=200, R2 & R3 = 100. You're misunderstanding what you need to drive a transistor. A transistor will allow up to a specific amount of current through the collector depending on the current that flows through the base. If less is needed by the load then less will flow. Think of it like a tap. If there's not much water pressure it doesn't matter how far you turn on the tap, after a certain point the flow of water won't increase any more. To allow 60mA through the collector you need to provide at least 0.6mA (assuming a hFE of 100) through the base. That 0.6mA will set the upper limit of the current to 60mA. If you provide more than 0.6mA then you will allow a higher upper limit. The 0.6V on the base is the voltage (difference between base and emitter when wired as "common emitter") at which current will start flowing through the base. It's the same concept as the forward voltage of an LED. For switching the voltage you put on the base must be more than 0.6V to allow current to start flowing. Since 5V is more than 0.6V you don't need to worry about it. If you want precision in your calculations you will want to take that 0.6V into account, though. R=V/I = (5 - 0.6) / 0.0006 = 7.3kΩ. That's the maximum resistance you want. Anything more than that and the current through the base will limit the current through the collector to below the 60mA you want. So you must select some resistance that is lower than that. What value? Well, it really doesn't matter that much. The lower the value the higher the current, but at these levels the current levels you're dealing with will be minuscule anyway. For all 8 outputs that's a paltry 35.2mA. Far below the total the chip can provide of 70mA. If you care about current consumption (you're running from batteries, for instance) you may want to increase to 4.7kΩ resistors to reduce the total drive current down to 7.5mA. Or use WS2812B RGB LEDs, easy to wire up in a daisychain. SMD typically, and Sparkfun carries 2 thru hole variants also. Not the answer you're looking for? Browse other questions tagged current voltage or ask your own question.